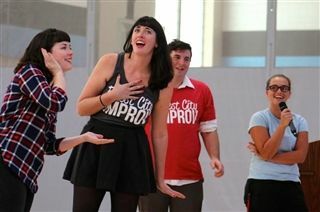 Last week, Finest City Improv members used wit and imagination to bring laughter to Community Life. During a series of improv games, the performers encompassed a variety of inventive characters while navigating audience suggestions on everything from the scene's genre to prop sound effects. Several students even joined the group onstage for skits. Pacific Ridge's own Improv Club president, Adam Poole, brought the house down with his take on a motivational speaker encouraging the turkey to roast during a friend's Thanksgiving dinner.